Visiting big cities can be intimidating at times but so much fun with your kiddos. 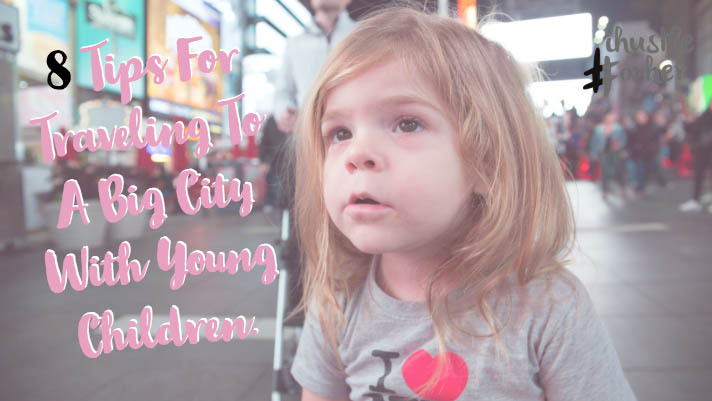 Here are some tips for parents traveling to big cities with preschool aged children. Hopefully, these tips will help you enjoy the journey more and allow you to venture past your comfort zone to places like New York City, Chicago, Atlanta, London, Paris, or whatever big city you might have on your family bucket list. Bring a lightweight foldable stroller: There are lots of reasons for this but the #1 reason is public transportation. If you plan on taking the Subway (and you should) you will need a stroller you can fold up quickly, and carry while carrying small children. Some people might skip the stroller, but I would not advise that since you will be doing a lot of walking. Baby carriers are nice but keeping a baby or toddler in one all day is close to impossible from my experience. Plan ahead: Make sure you plan what sites you are seeing upon arrival. Map out the mode of transportation you'll be taking so you don’t waste time figuring it out when you get there. Use Uber Family: If you plan on taking a taxi or other car service consider Uber Family. They come with a car seat for toddlers and are safer than no car seat. Make sure you research the car seat laws as well before you go so you are prepared. Bring a good backpack: Bringing a good backpack is better than bringing a side bag or purse. It will fit more but also will be easier when carrying children or strollers. You can fit all the necessities like, diapers wipes, snacks, your wallet and a change of clothes. Be ready to wander: When traveling in general you need to be prepared to wander and get lost. Make sure you are set for the day when you leave your hotel because who knows where the day might lead you. Relax and go with the flow. If things don’t go as planned, then be ready to figure out something else to do. Bring a soft wearable baby carrier: If you have a soft baby carrier, like a Baby K'Tan, bring it to stuff in your backpack. This is in case you need to "wear" your baby or toddler around for a bit. It's helpful on public transportation, or if baby needs to nap and viewing the city activity from her stroller is too distracting. Bring a mobile phone charger: This is for more than one reason. One, you will be taking lots more photos on your phone so the battery will likely go down quicker. Two, you might get lost or use google more than normal and don’t want to get caught with a dead battery in the city. Get a hotel in a more residential area: If visiting a city, finding a hotel away for the hustle and bustle can be better with small children. Less noise at night and more family-friendly dining nearby. There are also normally tons of parks in the city around residential areas and it is nice to have somewhere to take the kids to play nearby. Safe travels, and don’t forget — traveling with kids is possible and fun! Take a deep breath and enjoy the special family time. You and your children will learn so much and the memories will last a lifetime.